Making Hashem Proud: Author Interview + GIVEAWAY! Congratulations to our winner – Gila! Stay tuned for our next giveaway coming up soon! 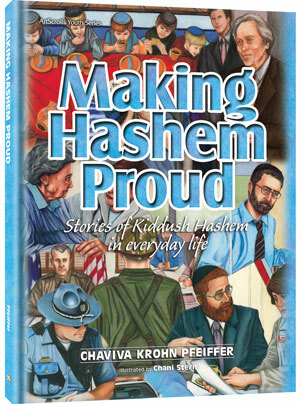 ArtScroll’s new children’s release, Making Hashem Proud features stories that teach children about the importance of behaving properly and making a Kiddush Hashem. ArtScroll talked with the author, Mrs. Chaviva Pfeiffer, about this exciting new book. Scroll down past the interview for a chance to WIN a copy of this book! ArtScroll: Can you tell us how you got started writing? Chaviva Pfeiffer: The Maggid Series, written by my father, Rabbi Paysach Krohn, is extremely popular. Adults would read the stories and often repeat them to their children. However, the children needed the stories explained. The idea was born to have the stories written especially for children. Back then, my husband was a 6th grade Rebbe, and each week he would give his students a story that related to the weekly Parshah. The stories were taken from my father’s Maggid books, and I would rewrite them to make them easier for the boys to read. My father liked the way I wrote them, and told me about his idea to write a children’s book featuring his stories. We approached ArtScroll with the idea, and they liked it. Since then, I’ve published three books of Maggid Stories for Children. ArtScroll: Your latest book, Making Hashem Proud, just came out, is different. Can you tell us more about it? Chaviva Pfeiffer: Unlike my previous books, where I wrote over the Maggid stories in a kid-friendly manner, Making Hashem Proud contains stories that I researched for my topic, Kiddush Hashem. ArtScroll: How did you choose this topic? CP: I was approached by Rabbi Shragie Freedman, who has dedicated his life to researching and teaching about Kiddush Hashem. He asked me to write a book of stories on a children’s level. He started me off with some stories, and then I began to look for more stories on my own. ArtScroll: Was it hard to find the stories? Chaviva Pfeiffer: You would be surprised by how many people were involved in or witnessed a story about Kiddush Hashem. Once I put the word out that I was looking for stories on this topic, they started to come in. The hard part is actually verifying the stories! My father is always very careful to meticulously research the origins of a story, and talk to the people involved to make sure it’s completely true. That’s what I did with these stories as well; it’s the Krohn way. I feel that if a story isn’t true, the inspirational lesson you might learn from it just isn’t that strong. One of the stories in the book involves a class of 2nd graders who acted in a manner that was so impressive, a business owner decided to close on Shabbos because of them! It’s a beautiful story, and one to aspire to, because it’s true. If it weren’t true, would you feel as inspired? ArtScroll: Your book features illustrations along with the stories. Can you tell us more about that? Chaviva Pfeiffer: The illustrations are done by Chani Stern. At first, she showed us some basic sketches in pencil only. I came into the ArtScroll office and sat with Reb Avrohom Biderman to decide if the sketches fit the story. Once we approved them, they were finished and created in color. There’s a lot that goes into choosing illustrations. For example, we like to show emotion in the characters. While a picture might look better from the back, I prefer to show the person’s face so you can see how he feels. You also have to make sure a picture doesn’t give away too much. Originally, one of the stories in Making Hashem Proud had a picture right in the beginning which gave away the end of the story, so we moved the illustration to the end instead. ArtScroll: Who is this book intended for? Chaviva Pfeiffer: The book is geared to children about 7-10 years old to read on their own, but you can read it to children as young as 3-4. My goal is to teach children that they have the ability to make a Kiddush Hashem, whether public or private, no matter how old they are! **Giveaway ends on Thursday, March 13th at 11:59 eastern time. Prize can be shipped within the USA. Winner will be notified via email. Valid email address must be provided to claim prize. Limit one entry per person.